Iran’s Foreign Minister Manouchehr Mottaki in a meeting with Hamas political supremo Khaled Meshaal on Sunday called for the lifting of Israel‘s crippling blockade on the Gaza Strip. “The Gaza blockade should be lifted and Gaza port and the crossings should be reopened for reconstruction,” Mottaki told the Palestinian official in Tehran, state television reported on its website. Meanwhile, Hamas leader Khaled Meshaal on Sunday praised Iran for helping Hamas achieve “victory” over Israel in Gaza, according to Iranian media reports. “The victory of the people of Gaza was a miracle of God and the Islamic Republic definitely has a share in this victory,” Meshaal said after meeting with Iran’s Supreme Leader Ayatollah Ali Khamenei, according to Iran’s semi-official Fars News Agency. 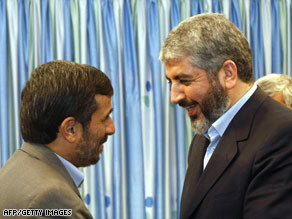 Hamas leader Khaled Meshaal, right, greets Iranian President Mahmoud Ahmadinejad on Sunday. You are currently browsing the archives for the Manouchehr Mottaki category.